Engravable Wedding Bands and What to Engrave on Wedding Bands? A personal, meaningful message engraved inside a wedding band makes the symbol of the eternal love between a couple even more special for the two of them. It can be a favorite saying, a religious message, a line from a sentimental poem or song, or your names and the date on which you were married. It can be any unique token of devotion to each other. Your engagement and wedding rings are symbolic of the love you and your partner share. Since you are meant to wear these rings forever, engraving a short sentiment on the inside of them will serve as an additional reminder of your engagement, wedding day and love. Choosing wedding bands can be one of the hardest decisions you make during the wedding planning process. Once you and your fiancé decide on bands, you may also want to consider having them engraved. Since the engraving is done in the inside of the ring, whatever you inscribe is something special and a private message shared between you and your fiancé. Deciding what to engrave can be a tough, but there are a few traditional options you may want to consider. 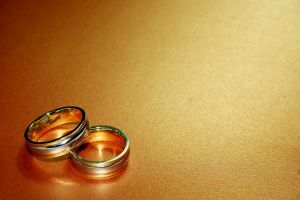 Some popular ideas for engraving an engravable wedding band other than the traditional names and date are taken from old religious phrases. Some of these phrases are: Bless O Lord This Ring; Forever and Ever; God Joined Us; Our Unity Is in Christ; and For Whither Thou Goest, I Will Follow. Perhaps the most traditional choice of something to engrave on engravable wedding bands are dates. You can engrave the date of your marriage, the date you met or any other date that holds a special meaning for the two of you. When engraving a year, consider using Roman Numerals for a different type of design. If you want to engrave a date, you will need to detail the format you prefer. You can use strictly numbers, for example; 1/1/2010, a mixture of letters and numbers; January 1, 2010 or you can formally write out the date; First of January, Two-Thousand and Ten. Your wedding date and engagement dates are important to always remember. To ensure you never forget, engrave it on the inside of the ring. As the years go by, you will have a small reminder of that special date. While anniversaries will come and go that date will be locked in, and celebrated, forever. My husband's ring is engraved with the date. But, my bands are dotted with small diamonds so there is no room for engraving. One question frequently asked is can Titanium Wedding Bands Be Engraved? The answer is yes, your expert engraver can engrave your special message on the inside of a titanium band. To make your titanium band truly yours they can engrave your special message. It is even possible to order your titanium band through an engraving through a specialist web site.